Small/Medium - $94.99 Only 9 left! nice costume for the money-- I am 5'11 220 lbs fit great (Large/x large) The only problem to fix is the head moves around when you wear it.....need to stabilize it with chin strap. Very pleased with this costume. 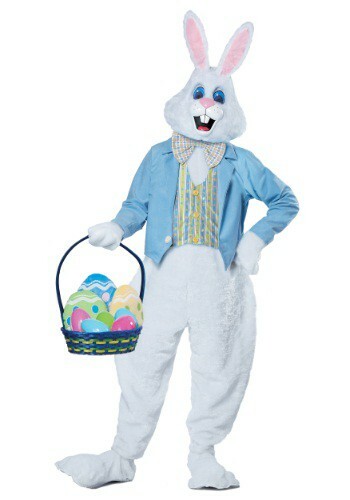 Will be worn at an Easter photo session. It is nice quality material. Happy we ordered. This Bunny outfit was way cuter then the picture. The kids loved it. This costume was a hit taking Easter pics for our church. It was not a hot costume except for, of course, under the bunny head. It was well made and will last a lot of years for our church! Thanks for the great review, we're so happy to hear that the bunny was a hit. This is the best out there. It's traditional and classic. The costume is so well made. The most important thing for us when looking for a bunny costume was the eyes. All the other bunny head's eyes were scary, dark and not inviting. This bunny head is perfect.